I have had a draft team of one sort or the other for about the last thirty or so years. I have a team of Belgian mules right now. They are getting old and will soon be retired (NEVER sold). I would like to get a team of EITHER the old-style, short, thick american Belgians, suffolks, or brabants. From my research I assume I will have to buy them young as broke ones are hard to find. Can someone offer breed advice/preference? Also contact info of people that still raise the short thick Belgians would be helpful. Not interested in the "hitchy" style Belgian. Disposition is waaaaaaay more important to me than anything else. Thanks for any info. Stephen Leslie did a great article on this a while back as part of his Market Gardening series. 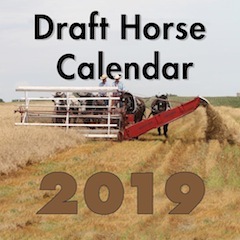 We put it up on the site in the Resources/Draft Horses section. The varied advice of eight draft horse farmers is included, in addition to Stephen's. American Belgians and their cousins, the Brabants, are far more predisposed to CPL than are Suffolks. Whoever you end up buying from, try to find a breeder that avoids propagating specimens that exhibit symptoms of CPL. Since I am quoted in the Stephen Leslie article I do not have to repeat myself, but it is obvious that in the accompanying picture I am hilling, not plowing. I have two Percherons that resemble the old style more, even though they are tall , but their bodies are big and their legs proportionally shorter than in the modern types. One of them is really quiet( the Modoc Herbie son, raised by the Browns in Iowa), the other one is a bit more excitable, but probably because before I got him he was a hitch-horse in a show hitch and he acquired a certain type of behavior. But even he can slow down a lot when required. Basically I agree with your premise, Steve, that it will be easier to find the horse with the calm disposition among the old-style drafters. I do not know where one would go today to find a true old style American Belgian. I friend of mine raises what some people would call old style Belgians, but most of his horses reach 17H at maturity, and the old style horses were often 16H or less. The closest thing would be a Brabant or Suffolk. I've attached a picture of my friends stud. At one time, he would have been considered a pretty modern horse, while today, he is considered by many to be fairly old style. Waiting on the answer to CPL? Thanks. Never heard of it before. Just my observation, but there is more difference withing breeds than between breeds. You can find a horse of team of horses that will fit your description in any of the breeds. My grandfather preferred shires and bred his they way he liked them. His were moderate by todays standard and were 16-17 hands and weighed 1500 to 1700 lbs. Towards the end of his breeding he started to "put some air under them" as he liked a horse that could move out. The one thing grandpa would not negotiate on in his breeding was disposition. The horse had to want to work and be calm by nature to be kept. The few people that have some of his stock are always happy with the willing nature and people pleasers. I know one shire cross colt out of a percheron mare from grandpas last stud that is becoming a great all around horse. Not big just honest and totally willing. You don't say what you want to use them for. If it's plain, straight farm work, then there is nothing better than a Suffolk. They were bred to do farm work and not for anything else. Easy keepers and extremely strong for their size, their disposition and willingness to work at a steady pace is unmatched by any other breed. I mostly have them just because I like them. I rent my farm out now but kept about five acres (or less, depending on the year) of corn to put out and mow and rake some hay with them. Haul firewood, haul manure, just play mainly. Best advice about horses I ever received is own the ones that give you joy. That followed up by something a friend said, "Life is to short to dance with ugly girls or drive ugly horses." We all have difference preferences and what we behold as beauty. If you are playing with horses play with the ones that you like. I ride and drive cheap animals, most of the time I can turn them around and make them good animals worth more to me and everyone else. Some never leave because no one else can get along with them. that is where the old saying (Just because there broke for me does not mean there broke for you). Good point KC! We all like them a little different based on what we do with them. I like a driving horse that will walk out and cover some ground. I like a little chrome, knee action, and up headed. Others like to dial them back a few notches. It all depends on our use. If you have plenty of time and work you can make a workable critter out of most horses. The trick is having enough work often enough you can sweat the knothead out of them. Lot of good advice given. KM's and KC's advice is spot on to what my dad used to say. Also, the best looking horses usually have sweat on them! When we were selling a lot of horses when I was a kid, a couple of older guys always told people "just because that kid can ride them doesn't mean you can". If we sold them as broke they were, but that didn't mean you could take them home and feed them gallons of sweet feed and no work and expect them to be the same 90 days later. To the original question starting this thread, find what you like. You will be more inclined to use them so they will be more inclined to be a great team. With my lack of height, a shorter team was always enjoyed and my team of Norwegian Fjords have been fantastic. With the health problems over the past couple of years with my arm, they have been a source of joy if for no other reason they enjoy being brushed and talked to. Hope you find what you are looking for. Yes if you are not farming A large amount of land with them, the smaller animals will do you as much good as a big team that you have trouble harnessing. I'm 5'5" tall, I Have had both shoulders broke and I have trouble harnessing the tall ones . I drive 14 1/2 hand some 15 hands tall horses and mules some of them might weigh 1100-1200. most take a 16"-18" collar. they will travel 5-7 miles in a hour pulling a fair load on rubber wagon 1 ton of salt. When in shape. We have mowed most of the day with a 1000 lbs animals.